LOCAL: Surging bank prices have pushed the ASX 200 to close 1.9% higher at 6006, the highest value since October last year. This is the biggest one-day gain since 10 November 2016, a year when the ASX regularly made intra-day gains of 2% or more. - Westpac had the biggest gains, up 7.4% to $26.70. This is the biggest one-day gain for the bank since March 2009 when it was recovering from the global financial crisis. ANZ Bank closed up 6.5% to $26.86 and Commonwealth Bank was up 4.7 per% to $73.60 - taking the stock back to where it was in August 2018. - The biggest one-day gain is in insurance company Steadfast Group, up 11.5% to $2.91. - AMP jumped nearly 10% to $2.43. - Ausdrill rose 9.5% to $1.38. EUROPE: The Stoxx Europe rose 1.4%, its sixth consecutive session of gains, to hit its highest closing value since early November. The index was boosted by momentum from Wall Street’s positive start to the week, with oil and banks tocks leading the way. The Stoxx Europe 600 gained 0.7% to 362.5, after finishing up 0.2% on Monday. U.S.: The stock market has rebounded from a dreadful December, and investors are keying in on President Donald Trump’s nationally televised address late Tuesday for indications of any fresh jolt to the economy and their wallets. Stronger than expected earnings reports also led the S&P 500 to its fifth consecutive session of gains. - Beauty products maker Estée Lauder and fashion house Ralph Lauren were the latest companies to impress investors with their profit reports. Both stocks rose more than 9% to lead the S&P 500 higher. 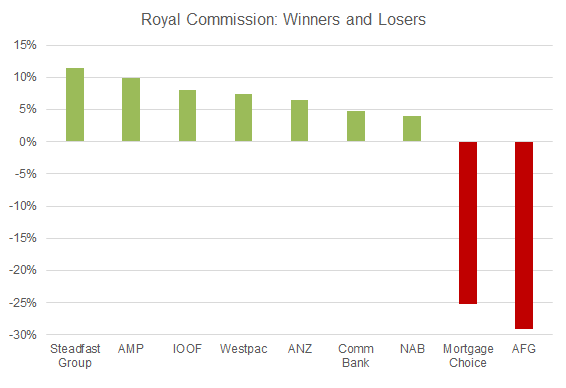 Based on the performance of equities yesterday, the worst fears for the financial services Royal Commission were not realised. Among the key recommendations was no changes to vertical integration (primarily impacting IOOF and AMP), nor changes to responsible lending laws (the major banks). Mortgage brokers were significantly impacted, however, with the banning of trailing commissions for mortgages. Among the gainers yesterday were AMP (+10%), IOOF (+8%), along with the major banks, which all advanced between 4% and 7%, reversing some of the more recent losses. Brokers Mortgage Choice and AFG, meanwhile, both lost more than 25% of their value.